Starting from the top line, net interest income (NII) rebounded 0.9 percent quarter on quarter (QoQ) in Q4, mainly due to a drop in the funding cost stemming from reduced Emergency Liquidity Assistance (ELA) funding and improving deposit spread and mix. However, NII for the whole of 2015 eased 2.2 percent year on year (YoY). This is largely attributed to a sharp rise in ELA funding, from zero in the second half of 2014 to a peak of 86.8 billion in June 2015. It remained above the 65-billion-euro mark from February until the end of 2015. As an indication of the burden of ELA cost on banks, it is worth noting that the Bank of Greece (BOG) reported in its 2015 annual financial statement that last year it received 914.6 million euros from Greek banks in interest on ELA funding from just 40.5 million in 2014. This bears an interest cost of 150 basis points (bps) above that of ECB funding, while banks also pay fees to the Greek government for the state guarantees they use as collateral. The improving liquidity conditions after summer, amid the stabilisation of the private sector deposit flow and completion of bank recapitalisation, led banks’ managements to guide for reducing or even eliminating use of pillar II bonds in the course of 2016, with a consequent positive impact on their operating income. 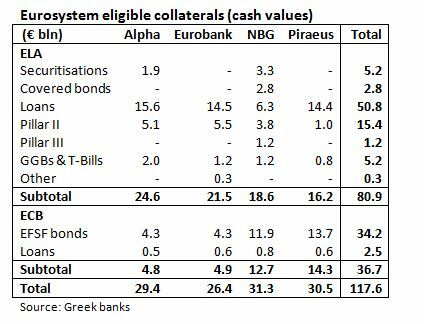 The breakdown of the total ELA eligible collateral (cash values) worth around 81 billion euros shows that almost 51 billion relate to credit claims, with pillar II bonds next at 15.4 billion, while Greek government bonds and T-Bills as well as securitisations amount to 5.2 billion each. In addition, the cash value of ECB eligible collateral currently stands at 36.7 billion euros. The bulk is EFSF bonds - and more recently ESM bonds for NBG and Piraeus – banks received during their recapitalisation. Since last September, Greek banks have resumed tapping the interbank market. Repos currently exceed 8.2 billion euros (Eurobank 4.6 billion, Piraeus 3.3 billion, Alpha 0.3 billion) replacing accordingly the more expensive ELA funding. Banks have lost almost 44 billion euros of deposits (at group level) within 2015, with the bulk stemming from the Greek market. However, they saw inflows of around 4.4 billion in Q4. 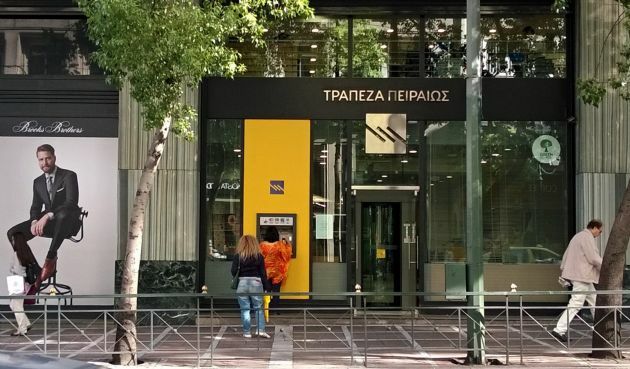 Meanwhile, the time deposit rate in the Greek market notably fell from around 1.8 percent in the first five months of 2015 to around 1 percent by December. The change in the deposit mix is expected to further support the NII rebound in 2016. At the same time, deleveraging continued with gross loans further easing by 2.6 percent to 233.7 billion euors at the end 2015. There was a marginal contraction of 0.3 percent QoQ in Q4. Fees climbed 17.4 percent QoQ in Q4 after a low recorded in Q3 amid capital controls, but the full-year figure points to a 3.9 percent drop. Most banks guided for a double-digit rebound in commission income in 2016. On the cost front, the number of branches has been reduced by almost 1,200 in 2010-2014 to 2,562 at the end of 2014 and the staff by more than 15,000 employees to 44,332. The reduction was mostly evident in 2013 and 2014 also in the aftermath of the last round of domestic M&A activity and the consequent closing of branches as well as implementation of voluntary retirement schemes. Banks target further cost reduction in the next few years, which has been incorporated in their updated restructuring plans. They mainly aim to achieve this through further voluntary redundancies. Three of the lenders (Alpha, NBG and Piraeus) have already booked in their Q4 results the cost of the voluntary redundancy schemes they plan to be implement in 2016. The deteriorating environment in the second half of 2015 coupled with the ECB’s Asset Quality Review (AQR) results prompted banks tio increase their provisions for credit risk by 3 billion euros YoY to 12.85 billion in 2015. In Q4 in particular, loan provisions almost tripled QoQ. As a result, the cumulative provisions rose by more than 9.7 billion euros to 57.9 billion at the end of 2015 from 48.2 billion a year ago. The difference of around 3 billion euros between the rise in cumulative provisions and the 2015 P&L provisions is largely explained by loan write-offs. Overall, Greek banks’ provisions corresponded to almost a quarter of gross loans from a fifth a year ago. The non-performing loan (NPL) formation showed mixed trends in the course of 2015. It halved QoQ in Q2, than it doubled in Q3 amid capital controls and more than halved again in Q4. Overall, the stock of group NPLs rose by more than 3 billion euros in the course of last year to 85.1 billion at the end of 2015. In addition, the NPL ratio increased by 2.4 percentage points (pp) to 36.4 percent. Despite the NPL rise, the sharper increase in provisions led to the NPL coverage ratio improving by more than 9 pp to 68.1 percent in 2015. Both in absolute and relative terms, Piraeus has the highest NPLs, while NBG figures stand at the low-end. In addition, NBG has by far the highest coverage ratio, with Eurobank and Piraeus at the low-end. It is worth noting that Piraeus was the only bank that reported a reduction in its NPL stock last year, even when stripping out Cyprus and Egypt figures that were included in its 2014 figure but not in the 2015 data. The picture is different, though, if we look at the non-performing exposure (NPE), where the stock reached 115.8 billion euros and the relevant ratio and coverage both stood at 50 percent. Eurobank has the lowest NPE ratio (43.8 percent). Alpha (51.3 percent) and Piraeus (50.7 percent) are at the high-end. Banks noted NPL formation in Q1 this year is broadly similar to that recorded in Q4. Most of them guided for a reduction in the NPL stock and ratio by the end of 2016. Following the last round of their recapitalization process last November, their capital base was notably enhanced with their phased-in Common Equity Tier 1 (CET1) ratio above the 17-percent mark in almost all banks. The fully-loaded Basel III CET1 ratio indicates NBG and Piraeus figures excelling, while Eurobank ratio stands way below those of its domestic peers. Under a baseline scenario, assuming a swift conclusion of the first programme review and a rebound of the domestic economic activity in the second half of the year, all banks guide for a positive bottom line result in 2016. This largely reflects a sharp drop in loan provisions and an NII rebound on the back of reduced reliance on ELA funding and lower funding cost. In addition, fees are expected to grow at a double-digit rate, while expenses are seen heading south. Apart from the political and economic developments, the single most important risk for banks’ fundamentals this year relates to NPL management, which could lead to the targeted reduction in the huge stock of bad loans and be supported by more aggressive restructuring. The medium- term target (by the end of 2018) of a sharp drop in the NPL ratio from its current level of more than 36 percent to under 20 percent seems ambitious and the biggest challenge for banks going forward after the completion of their third recapitalisation process.